The meaning of ‘Scotch’ is of course clear to many of us. But for some it just conjures images of sticky tape or perhaps a popular protective treatment for upholstery. So how do we define Scotch and what else would you need to know to explain it to the beginner? Here are nine Scotch FAQs to give you a solid grounding. Does it have to come from Scotland? How does Scotch become peated? What are the whisky regions of Scotland? How many calories are there in Scotch? 1. Does it have to come from Scotland? Yes. The producers of Champagne must make their sparkling wine in the Champagne region of France before they can label it as such. Distillers who want to call their product Scotch likewise must produce their whisky in Scotland. But that’s only one stipulation of the Scotch Whisky Regulations 2009, the legislation under which the production, bottling, labelling, packaging and advertising of Scotch whisky remains governed. Based on the Scotch Whisky Act of 1988, the Regulations make for interesting, although perhaps not bedtime, reading. 2. What do the Scots drink? According to the 2017 Britain’s Biggest Alcohol Brands report, published by The Grocer, The Famous Grouse was the UK’s tenth biggest alcohol brand by off-trade value, and the only brand of Scotch whisky to make it into the report’s top ten. The Famous Grouse certainly does command a significant presence in Scotland even if this report does not state figures by country. Statistics aside, many enthusiasts will find it difficult to single out a favourite dram on account of the myriad of styles and flavours available. 3. How does Scotch become peated? In order to produce malted barley, maltsters must germinate green (fresh) barley and then quickly halt the process of germination. Distillers use a kiln for this. Peat fires heated the kilns in days gone by as peat was the most abundant and accessible source of fuel across the country. Alternative fuel sources eventually took the place of peat in kilns, but many producers today still rely on peated barley in varying proportions in their mashbills. Tarry, smoky flavours arise in whisky produced using peated barley. For more information about peated whisky, read our guide here. 4. Which should I start with? The world’s favourite whisky boasts a glorious variety. While this offers lots of room for exploration, it can also be somewhat difficult to know where to start. 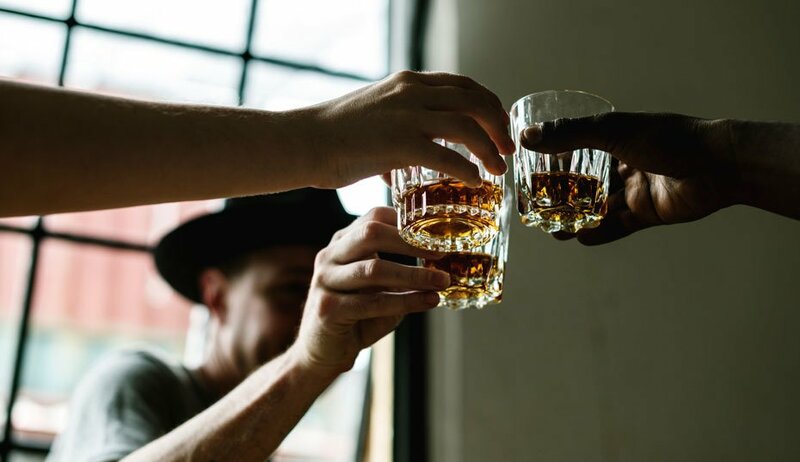 To help you along, World Whisky Day Ambassador Aly Mathers has taken your favourite tipple – be it rum, beer or even mescal – and recommended a Scotch you’re likely to enjoy. 5. What are the whisky regions of Scotland? Highlands and Islands (Islands is often considered a region in its own right). Of course the characteristics that define these regions are less exclusive now than they were when the regions were established. Heavily peated whisky, for instance, doesn’t have to just come from Islay. That’s why some people are reluctant to apply geographical constraints when talking about whisky today. 6. What are the different categories of Scotch whisky? Single malt Scotch whisky must be distilled at a single distillery. Single grain Scotch whisky is also distilled at a single distillery but made from cereal grains rather than just malted barley. Blended Scotch whisky combines one or more single malt Scotch whiskies with one or more single grain Scotch whiskies. Blended malt Scotch whisky is a blend of two or more single malt Scotch whiskies from different distilleries. Blended grain Scotch whisky is a blend of single grain Scotch whiskies, which have been distilled at more than one distillery. 7. How many calories are there in Scotch whisky? Clocking in at a mere 64 calories, a 25ml measure has fewer calories than a banana! 8. What is blended whisky? Blending came about at a time when producers were keen to ensure consistency across their bottlings. Every cask of whisky matures in its own way; blending allows producers to effectively lessen any resulting differences and, through reliance on recipes, arrive at a consistent product. The advent of blending was one of the most significant developments in the history of the spirit. Blended whisky is still big business, accounting for 90 per cent of all Scotch whisky shipped across the world. 9. Does it go off? In theory, no. Sealing the bottle with a screw top (as is generally the case today), means it is not possible for oxygen to come into contact with the whisky, thus preventing oxidation (the going-off process). Even in the case of older bottles sealed with corks, though, oxidation is minimal because of the high levels of ethanol, which absorbs oxygen in the first instance. Wine, with its lower ethanol content, is somewhat different. Some wines can benefit from oxidation in the bottle over time (and time to breathe prior to serving). Others are more suited to being kept light and fresh, and are thus closed with screw tops and not generally decanted. In conclusion, your sealed whisky will remain largely unchanged over the years. Once you’ve opened it, however, the process of oxidation begins. You’d generally want to finish a bottle within a year of opening, and two at the most – bearing in mind that the less whisky it contains, the quicker oxidation will take place.